Radiation therapy is a non surgical treatment option for patients with superficial skin cancers. During radiation therapy, a specialized machine is pointed directly at the skin cancer, high energy waves are then released on to the skin, affecting the cancer cells' ability to grow or multiply. Over time the cancer cells die off, leaving behind only healthy skin cells. Radiation therapy can be used to treat some cancers on its own, or it can be used in combination with other treatments, such as surgery or chemotherapy. 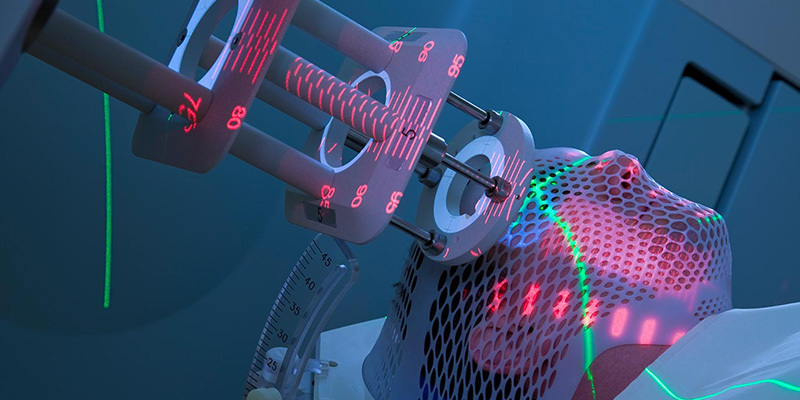 Radiation therapy is often reserved for patients who are unable to tolerate surgery, who have a skin cancer that is difficult to remove, or who have recurrent skin cancers. It is also more common for older patients to receive radiation therapy for skin cancer as secondary cancers have a tendency to develop 10 -15 years after initial treatment. There are different types of radiation therapy. Xrays, gamma rays, and charged particles (ie: photons) are types of radiation used in cancer treatment.¹ Radiation therapy does not kill cancer cells right away. It takes days or weeks of treatment before cancer cells start to die. Cancer cells continue dying for weeks after radiation therapy ends. Radiation treatments are short, painless, and are usually given in many doses over several weeks. Radiation treatments are managed by a radiation oncologist in a hospital or radiation treatment center. A specific treatment plan will be designed for qualified patients based on the type and the location of the skin cancer. During the course of radiation treatment, the treated area may become red, dry, and tender like a sunburn. Patients will want to speak to their physician regarding best practices for skin maintenance during this time. A physician may recommend hypoallergenic skin care products and will advise on best practices for sun protection. Most of the time, the cosmetic appearance after radiation is excellent, however, there are some instances where radiation treatment causes the skin to appear thinner and slightly scarred. Additionally, when extensive cancers are treated with radiation, the skin may contract, causing tightness and deformation of sensitive areas such as the nose, eyelids, and ears. Patients should speak to their physicians about the expected outcome of their skin cancer treatment in advance. At SCARS Center we explore every potential option for skin cancer cure, applying the methods that work best for our patients and their lifestyles, while providing the most cosmetically sound outcomes possible. ¹ National Cancer Institute. (2010, June 30). Radiation Therapy for Cancer. Retreived from https://www.cancer.gov/about-cancer/treatment/types/radiation-therapy/radiation-fact-sheet. Allow our physicians in Newport Beach to develop a cosmetically sensitive treatment plan for you today.